Kamikatz Beyond The Sea is a 4.5% gose from Rise & Win Brewing, based in Tokushima, Japan. It’s part of their bottled and draft lineup, though it is limited edition, so it’s unknown whether it will be released again. Kamikatz Beyond The Sea is brewed using locally harvested sea salt from the Kiisuido Strait, between Tokushima and Wakayama. It also uses iyokan, a Japanese citrus fruit, similar in appearance to a mandarin orange, arising from a cross between the Dancy tangerine and another mandarin variety, the kaikoukanand, along with yuzu vinegar, both from the local Tokushima area. Kamikatz Beyond The Sea poured out a slight hazy orange brown colour with a finger’s worth of pure white head, which lingered before fading to a couple of bubbles around the side of the glass. It had a seawater-like aroma to it, along with some fruity sour notes of yuzu and oranges; however, there wasn’t any malt aroma to note. It’s in the body where Kamikatz Beyond The Sea shines though with the seawater-like taste bringing a new angle on Rise & Win Brewing’s efforts. It paired off nicely with the sour yuzu flavours, darting between the two as it was being drunk. 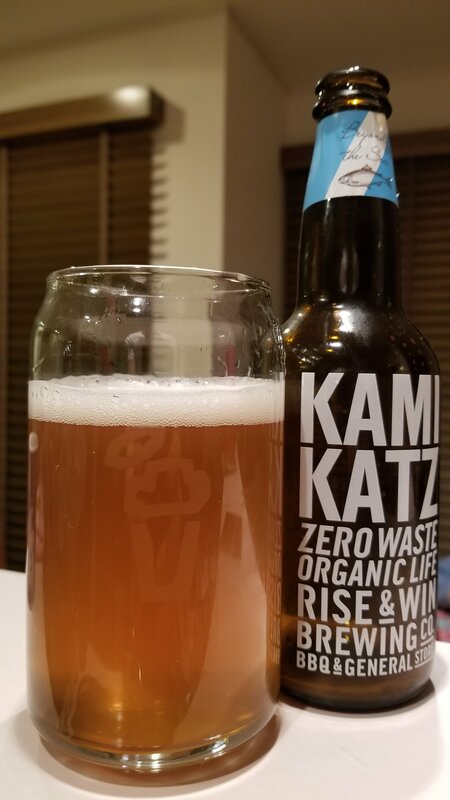 While it was a lot to handle once it had warmed up, Kamikatz Beyond The Sea was easy-drinking and would have been perfect for a hot summer’s day as it was certainly thirst quenching. While those wanting something malty or hoppy will be left disappointed, Kamikatz Beyond The Sea is all about the adjuncts, which left a strong, lingering presence on the palate. I didn’t think I was ever going to get a beer from Rise & Wing that I liked, but I’m surprised with Kamikatz Beyond The Sea. Try it!